Dealing with garbage and recycling is a fact of life, but if you organize your garage properly, you can make it less unpleasant by storing things properly to reduce the chance of spills and odors. As with all other aspects of the garage, everybody has different needs. Toronto homeowners have to contend with large blue and grey bins which can be hard to store, while outside the city, home owners use smaller bins and bags. Regardless of what you’re using to contain the trash, the goal is always to keep it as clean as possible and keep it from exposure to animals, especially raccoons. We create an area for garbage closest to where homeowners use it the most. 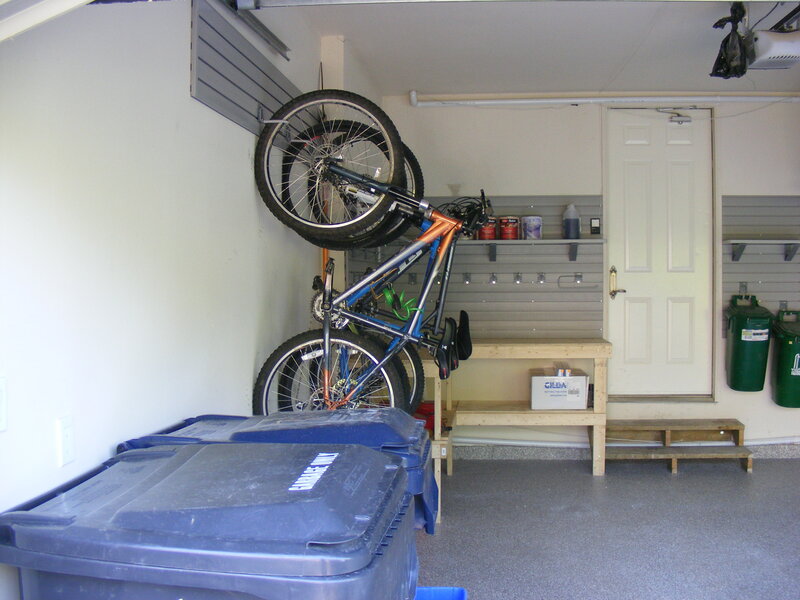 It’s typically found in the back of the garage, leading into the home or mudroom. 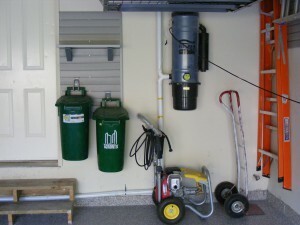 This way you can open the garage door from inside, drop the trash into a bin or can and be done with it. 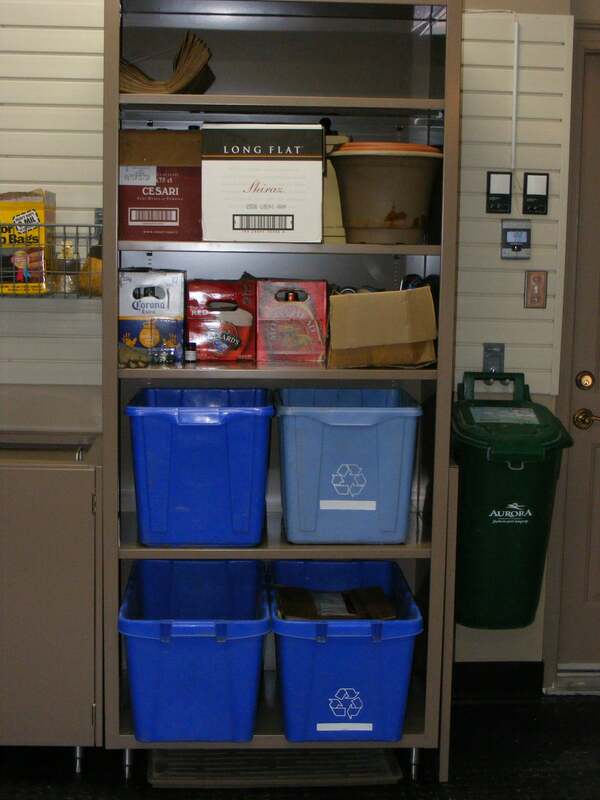 We find this space can accommodate your needs whether you live in the city with the large bins or out of the city with the typical garbage containers. If you really don’t want to see the trash and budget allows, we have even have built custom steel cabinets with sliding lids that hide it completely. Should you be using the blue boxes we find that simple steel shelving works nicely. The shelves are 18-24” deep and 36-48” wide and will easily accommodate the blue boxes without fear of them falling off, even when fully loaded! Alternatively, depending on the space available and your total garage storage requirements, we’ll even build wood shelves right into your space. They are tidy and give you more of a custom look. The idea with garage organization is to get everything off the floor, which is where we often find cases of empty bottles or cans. They are often in the way, sometimes broken and cumbersome to walk around, let alone be a hazard for young children. Either of the solutions mentioned above will nicely organize these items, and keep them off the floor. People who have two or more of the large black and grey bins occasionally find that they don’t have room in their garage for them. The simplest option is to store them beside the house as discreetly as possible, using a bungee cord to secure the lids from animals. Another solution is to build a small lean-to outside the garage. These structures can have both a front and a top opening so it’s easy to deposit garbage in them, and easy to roll them to the curb on garbage day. There are companies that make these bin solutions and cost approximately $1100 before installation. If these solutions don’t fit your space, we can build something more customized.